Taijiquan (Tai Chi Chuan) was generally considered to be represented by six main branches or lineages: Chen, Yang, Hao, Wu, Sun, each being the family name of the founder. In recent years, another lineage came into public prominence: Zhao Bao. Named after a town in Henan, rather than the founder, Zhao Bao Tai Chi Chuan, though new to the scene, is said to be the most ancient of the lineages. The tenets of Zhao Bao Tai Chi emphasize simplicity, stressing that one should be as “hard as iron, soft as cotton, slippery as a fish, and tenacious as glue.” Its philosophy is expressed in the composition of its stances, in movements that harmonize and flow with the anatomy of the human body. Its aesthetic draws inspiration from nature with the goal of achieving movement as light as a cloud and as fluid as water. This post has two clips. The first is an amazing demonstration of a Zhao Bao form by Master Liu Jingquan﻿. 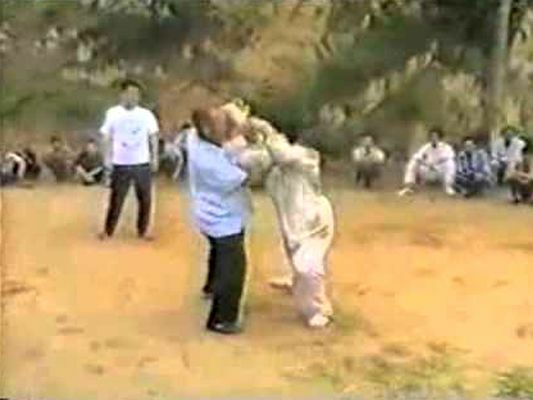 The second is of Master Wang Qingsheng displaying Fajin (force generation) skills at a village get-together.